Finding the best sailing vacations and preparing for a sailing trip are not generally easy tasks if you want to take your family on a real adventure. Sailing can get to be quite dangerous, so aside from keeping an eye out for weather changes and choosing a good spot, there are a few other things that need to be kept in mind. The first and most important task is ensuring that you and all those you take sailing are completely healthy and have everything needed in order to survive in difficult situations. While packing necessary items such as medical kits, prescription medicine, flashlights or necessary toiletries may be a good idea, you should also pack light, avoid large or heavy items and take only clothes that dry quickly. Most boats have limited storage, so try to carry only what you need. Also, in order to reduce stress levels during a sailing vacation, proper mental and emotional preparation is crucial, especially if you want to take children along. Practicing drills prior to the sailing trip will prepare you and your children in case of an emergency or bad weather, and controlled relaxation and breathing techniques will also play a major role in keeping everyone in a positive state of mind. Not everyone can afford expensive sailing trips, and if you go on vacation with your family, it would be best to locate a chartering service that can offer all in one crew, cooking and accommodation services, while providing additional facilities such as cabin suites with showers or pre-ordered groceries. 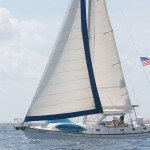 There are many Caribbean sailing charters which can provide optimal conditions for a family in search of relaxing sailing vacations in beautiful places such as the British and US Virgin Islands, and while the costs may not be too steep, newer and safer boats are being made available each year to ensure the maximum level of comfort and safety for everyone who takes part in the journey.